Postcard from Robert to Mrs. P.
Photo measuring 4.5 x 2.75 inches. Album mounts are still glued to two of the corners. It’s hard to explain why I find photos like this so mesmerizing. 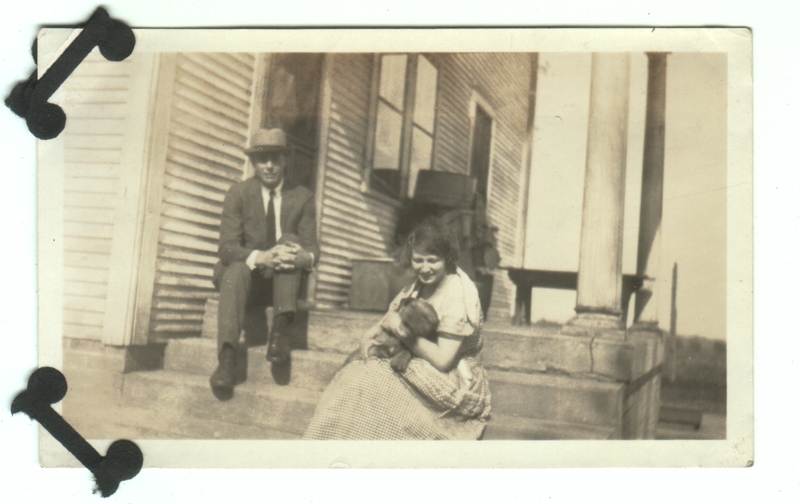 A man and woman sitting on a porch with the woman holding what I gather is a dog. That couldn’t be more ordinary. But there’s something about this photo that takes it beyond simply being an image from another time. There’s an extra something about it that feels dreamlike or otherworldly to me. The lighting feels almost staged. The tilt of the camera and the slant of the house feel almost expressionist. And what is obviously just blank sky somehow feels truly empty here, like the house is sitting in a void, despite our ability to see a horizon. There is also a degree of mystery added by things like the pile of boxes, and the people’s body language, which, although relaxed, leaves me wondering what their relationship is. Regardless of whether you have the same feeling about this photo, I hope you enjoy it. Yes, I really enjoyed it. Definitely there is lot of mystery around . Thank you, Anisja! I’m glad you enjoyed it.